This online-only article is a supplement to the September/October 2014 print edition of Home Energy Magazine. 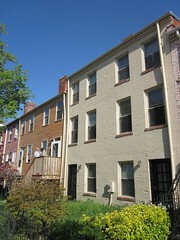 Our firm, Newport Partners, acted as the lead consultant on an occupant-in-place energy efficiency retrofit of a Sasha Bruce Youthwork group home in Washington, D.C. Project sponsors included DOE Building America, HomeAid DC, Home Builders Care Foundation, and the Walmart Foundation. Group homes are a bit like multifamily buildings (high occupancy) and kind of like single-family dwellings (common bathrooms and kitchen). But depending on which entrance you walk through, you might think that they were a cafeteria or an office. The International Building Code calls them R-4 occupancies, and lumps them in with alcohol and drug centers, assisted-living facilities, halfway houses, and so on. The Sasha Bruce group home was built circa 1900 and has 4,400 square feet of conditioned floor area. It has six bedrooms that house up to eight occupants, three active offices for up to five staff, five bathrooms (two with active showering facilities), three recreational or TV areas, and a kitchen that is used very heavily to prepare three meals per day for occupants and staff. Utilities in the all-electric building are paid by the owner, and were extremely high—in excess of $11,000 annually. Annual energy use intensity was also high, at 65 kBtu/ft2. As a point of comparison, new 2012-IECC compliant single-family detached buildings can be expected to consume less than 20 kBtu/ft2 in the same climate zone. Not only was the building highly energy intensive, but the costs associated with this energy use preyed on limited funds that Sasha Bruce could otherwise have used to provide or enhance programs. Sasha Bruce Home, front. The light-tan unit on the right and the brown unit in the center are connected on the interior by a hall. 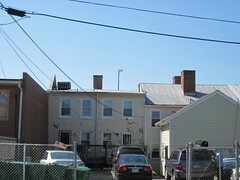 Sasha Bruce Home, rear. The structure with the gabled roof is an addition that is used as a recreational room. 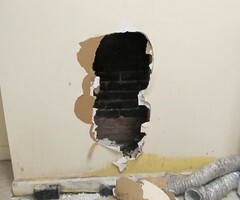 Exposing a hidden fireplace and flue. Figure 1a-b. 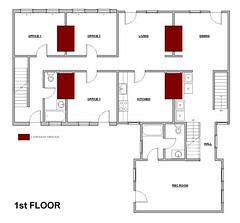 Floor plan with fireplaces shown in brown. Figure 2. 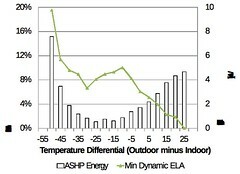 Effect of window operation (during hours with ASHP cycles) on building ELA at various outdoor-to-indoor temperature differentials. Figure 3. 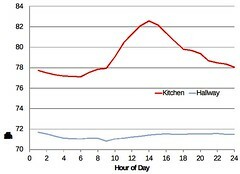 Kitchen and hallway average dry-bulb temperature profile during the month of February. Figure 4. Total energy use (pre- and postretrofit) and disaggregated energy use (postretrofit only) as a function of outdoor dry-bulb temperature. When we took on the project, many of the home’s appliances and equipment needed replacing; there were 4 inches of stagnant water standing in the return plenum of one heat pump; windows were in poor condition; and some light fixtures were broken. Figuring out where to begin on these projects can be daunting, especially when fixing what’s broken can conflict with the goal of saving energy. Let’s face it—broken lights use less electricity than their high-efficacy cousins. Ultimately, the energy efficiency measures (EEMs) were selected based not only on optimizing building energy and indoor environmental quality, but also on making the home more livable, safe, and affordable to operate. To select a package of noninvasive EEMs that could potentially achieve 40% energy savings, we conducted a site audit, including short-term testing and load monitoring; identified targeted EEMs; and performed building energy simulations and analysis to estimate associated savings. With the 40% savings and savings-investment ratio (SIR) criteria in mind, we conducted a building energy audit as the first step to selecting EEMs. In addition to all of the traditional components that you’d expect (inventory of building equipment, materials, and characteristics; and blower door and Duct Blaster tests), the audit included some short-term monitoring of loads on the refrigerator, the freezer, two clothes washers, two clothes dryers, the entertainment center, and the offices. We also collected 19 months of preretrofit utility bills and monthly average temperatures from the local weather station, so we could determine total energy use as a function of outdoor temperature. While the audit was more extensive than typical audits, it didn’t tell us everything. Short- term (less than one month) monitoring of loads was helpful for roughly estimating energy savings, but the results were not very conclusive. Another limitation was not being able to determine the R-value of the ceiling insulation because there was no attic access (and the audit had to be noninvasive—no tearing into ceilings). But the biggest miss was the13 fireplaces that were concealed behind the drywall (see Figure 1). We caught the 3 that were visible and assumed that any others that might be hidden behind the drywall would have been air sealed prior to enclosure, but we were wrong. And we were wrong about the number of fireplaces that could possibly be concealed, too. As we would later learn during the retrofit, each chimney stack had not 1 or 2, but 4 flues, connected to 4 fireplaces—meaning that there were 16 total flue breaches of the building envelope, each measuring roughly 1 foot x 1 foot. Who needs 16 fireplaces in 4,000 square feet? Next time we audit one of these old buildings, we’ll assume everybody does. While there are plenty of good software options for building energy simulations of single-family and multifamily dwellings, we couldn’t find one that was proficient in modeling group homes. BEopt was our preferred simulation tool, but the version available at the time had several limitations that eliminated it as an option. After a bit of searching, we decided to use REM/Rate. Where possible, we used audit data to verify building and mechanical characteristics, but we still had to make some assumptions for key variables, such as heat pump efficiency for a 19-year-old unit. In this particular case, we used Building America House Simulation Protocols to estimate equipment efficiency as a function of assumed maintenance schedules and age. Our first shot at the modeling produced a total building energy use that was about 20% shy of the actual site energy consumed (calculated as the running annual average over the previous 19 months; see Table 1). This difference seemed plausible, given the high variability in occupants, the weather conditions, the high cooking loads, and the three fully staffed offices within the building. 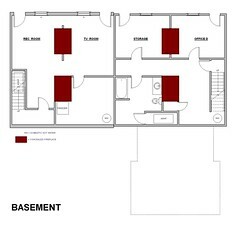 However, when we gained access to the attic during the retrofit, we found that one of our key initial assumptions was off base. We had assumed that a building constructed in 1900 with no attic access would have no ceiling insulation, but it turned out to have R-19 fiberglass. Changing the ceiling insulation from R-0 to R-19 meant that our building simulation was now over 40% shy of the actual site energy consumed. This was more troublesome. To true up the model with the utility bills, we ran a utility bill analysis in REM/Rate. It showed that the model was underestimating heating energy use by roughly 37% (~17,000 kWh) and underestimating base loads (lighting, appliances, plug, and miscellaneous) by about 70% (~27,000 kWh). We considered trying to true up the model to more closely approximate actual energy use with some typical tricks of the trade, but we felt feared we’d end up with a model that was more of a Frankenstein than a good representation of the building and its systems. To increase our heating energy use, we could have decreased the heat pump heating seasonal performance factor (HSPF), but we had already derated the expected performance based on Building America protocols. (For example, the 19-year-old heat pump was assumed to operate at 4.0 HSPF, far below its 6.8 HSPF rating.) Modeled ducts were very leaky, too. Our building leakage was confirmed with a blower door test, and R-values for wall and ceiling assemblies were reasonable and confirmed through inspection where possible. Appliance and domestic hot water use were already adjusted for occupancy based on the number of bedrooms, and it seemed a little ridiculous to ratchet up the number of bedrooms any further (we were already modeling eight bedrooms instead of six). We just didn’t have a lot of other levers that we could pull and keep a straight face, and we assumed that some of the biggest differences were probably due to occupancy and usage patterns that are associated with group homes in general (beyond the scope of the software) and this specific group home in particular. 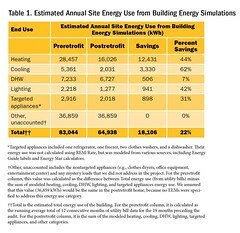 In short, we knew the building energy simulations would be limited in their accuracy (especially regarding magnitude of savings), but we used them to help ballpark anticipated savings from the selected EEMs on a percentage basis, understanding that final confirmation of savings would come from utility bills. Be minimally invasive: occupants to remain in place. Be economically viable: SIR of 1 or higher for the combined measures. Replace what’s broken and what’s old: windows, light fixtures, as many appliances as possible. Provide minimum acceptable indoor air quality (IAQ): comply with ASHRAE 62.2. Save a lot of energy: at least 30% from the basket of measures, though more would be better. The final package of EEMs was selected using these criteria. Energy use and savings attributable to individual measures were estimated using building energy simulations, Energy Star appliance calculators, and Energy Guide appliance labels, adjusted for the group home’s occupancy. Costs of candidate EEMs were sourced from contractor quotes or estimates. 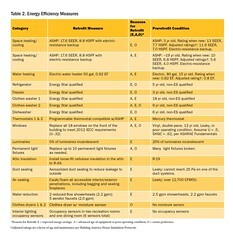 In addition to the no-brainers, the final list of EEMs included duct sealing, replacing worn-out windows and broken light fixtures, replacing existing appliances with Energy Star models, upgrading ceiling insulation, replacing the electric tank water heater with a smaller and more efficient model, installing programmable thermostats, installing lower-flow shower heads, and installing automated lighting controls. The final list of EEMs is given in Table 2. Taken individually, some of the measures were not cost-effective, such as replacing a three-year-old standard freezer with a new Energy Star freezer. And some of the measures actually increased energy use, such as replacing broken light fixtures with new ones. But again, optimizing energy savings was not the only goal of the project, and the final list of EEMs was approved because it met the project’s main objectives. You may be thinking that whole-house mechanical ventilation should have been specified among the EEM provisions. And generally speaking, you would be right; that’s best practice and was our preference going into this project. But best practice isn’t always possible when you have a limited budget. 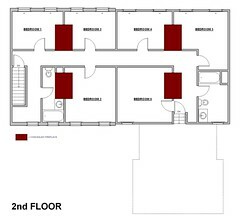 At the minimum, we needed to ensure that the dwelling had sufficient ventilation and infiltration to satisfy ASHRAE 62.2-2010. For existing buildings, the standard allows the user to account for building infiltration (we had a lot of that! ), existing windows, and existing local exhaust. Using this procedure, the standard indicated that no additional ventilation was necessary (though we would question this outcome, especially in regard to kitchen ventilation, as we’ll discuss later). Based on our first round of building energy simulations and analysis, we expected about 40% site energy savings from the EEM package—higher than the 30% that we were shooting for. (Bear in mind that the first round of simulations was within 20% of utility bills—fairly close for an occupancy that’s beyond the typical scope of the modeling software.) Two key assumptions in this estimate were R-0 ceiling insulation in the preretrofit house (turned out to be R-19), and an air-sealing improvement of 20% (we got only 7%). We assumed a 20% air-sealing improvement because we thought that was a conservative estimate based on typical 30% improvements cited in some weatherization programs. But the discovery of 13 hidden chimneys that we were unable to seal (because they were inaccessible without breaking through the drywall or going above the roofline, and because this work was not included in the budget) reduced our total projected energy savings to roughly 20%. We would have to wait for the postretrofit utility bills to determine the actual savings. Single-family and multifamily occupant behavior and energy use have been well researched and documented, but far less is known about user interaction with building systems and components in group homes. While the focus of the research project was on energy savings associated with retrofit measures, we also took some time to investigate window operation and kitchen use. Because the occupants were generally transitory and not responsible for utility bills, we assumed that window, and to a lesser extent, door operation could play a major role in the building leakage rate, and in the associated energy use of the space-conditioning equipment. We wanted to find out how often windows were open during operation of the air source heat pump (ASHP). This would indicate an opportunity for further energy savings. And we wanted to quantify the extent to which windows were open (that is, record the estimated leakage area) when outdoor conditions were cold, hot, or temperate. To record window and door operation, we installed a total of 33 state sensors, one at each window and at one exterior door. With these, we were able to record how long each window remained open at least 1.5 inches, and the time at which the window was closed and when the door was opened and closed. The sensors measured 1.8 inches × 2.4 inches × 0.8 inches and were easily installed on the window frame. Using a blower door, calculate the building’s baseline ELA with windows closed. Calculate the minimum opening area for each window and door, using a minimum opening distance of 1.5 inches (based on the sensor’s trigger distance). Calculate flow through the opening at a pressure difference of 4 Pa (assume that the window opening can be characterized as a sharp-edged orifice). For each hour during the monitoring period, calculate the ELA of each window and door based on the flow through the opening at 4 Pa, and the fraction of the hour that the window or door was open. Determine the minimum dynamic ELA (that is, the real-time minimum ELA of the building calculated based on window openings) for each hour by summing the baseline ELA with the ELA of each open window and door. Occupants tended to open more windows as outdoor temperatures became colder, increasing the minimum dynamic ELA by more than 19% when temperature differentials across the envelope were the largest. Window openings fell off as outdoor temperatures increased, suggesting that occupants were less tolerant of the introduction of warm outdoor air than to that of cold outdoor air. Overall, the data point to opportunities for energy savings through better management of window operation by the occupants, especially during periods of colder outdoor temperatures. Given the frequent turnover of occupants, we couldn’t ask them why they opened the windows. There were lots of potential explanations, but the increase in ELA during colder outdoor conditions suggested that overheating could have been a problem in the winter, and a closer look at kitchen temperatures pointed to a possible culprit. We realize now that we overlooked the impact that energy use in the kitchen could have on energy use in the group home. After many site visits, we realized that there was a lot of activity in the unventilated kitchen. This included several hours of range and/or oven operation each day to prepare two to three meals for 5 to 13 people (mostly adolescent boys, who aren’t shy when it comes to dinnertime). Unfortunately, we didn’t monitor the kitchen circuits for energy use, but we did monitor temperature in the kitchen and the adjacent hallway. Figure 3 shows average dry-bulb temperatures in the month of February for these spaces. The kitchen, which was locked when not in use, had consistently elevated temperatures, even at night. In group homes, excessive use of a kitchen without ventilation can have a major impact on heating and cooling energy use. We monitored postretrofit heating and cooling use, and noted that our heating energy use was 58% lower than expected from our building energy model, while our cooling energy use was 45% higher than expected. We suspect that the kitchen was the largest contributor to these discrepancies (providing useful heat in winter, but a costly load in the summer). However, the large internal heat gains produced by extensive cooking without exhaust ventilation could be partly to blame for temperature variation across floors. This temperature variation in turn could lead to overheating of the first and second floors, occupant operation of windows (though this is just a hypothesis), and ultimately more space-heating energy use. For this reason (and for reasons of IAQ), the building managers should consider installing and operating kitchen exhaust ventilation. Ventilating the kitchen during the summer not only would improve IAQ, but should significantly reduce cooling energy use as well. And ventilating the kitchen during the winter might also reduce frequency of overheating and window operation. From preretrofit utility bills (19 months) and postretrofit utility bills (11 months) we developed regressions of pre- and postretrofit monthly energy use as a function of monthly average outdoor dry-bulb temperature. We like average outdoor temperature as the independent variable because it’s easy to visualize and generally well correlated with total energy use (R2 ≥ 0.84 for our pre- and postretrofit condition), and because you don’t need a multivariate regression to assess the combined impact of heating and cooling degree-days. Using our pre- and postretrofit regression equations, we calculated monthly energy use under both scenarios based on the average monthly temperatures for a typical weather year in Washington, D.C. 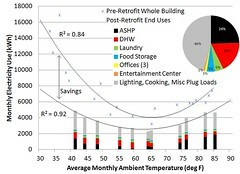 Percent savings were then calculated as the difference between the annual total energy use in a typical weather year for the postretrofit scenario versus the preretrofit scenario. The utility bill analysis that we used to assert 41% energy savings is visualized in Figure 4. The pie chart shows the percent distribution of end use loads for the postretrofit scenario, based on monitored energy use with watt-hour meters. Over 11 months of postretrofit data, only 24% of building energy was used for heating and cooling. The lighting and miscellaneous loads (excluding clothes washing and drying, refrigerator and freezer use, the entertainment center, and the offices) had the lion’s share, at 46% of energy use. We assume that most of this use was for cooking and lighting. Although the lighting was converted to high efficacy, it was used round the clock in this 24-hour facility. We used a SIR calculation to evaluate the economic viability of this energy efficiency retrofit, since this is the most common metric used in multifamily weatherization projects. SIR can be calculated many different ways, and we wanted to ensure that ours accounted for the residual value of any equipment that we were replacing. For example, replacing 20-year-old windows should result in a better SIR than replacing 1-year-old windows, even if the efficiency of the windows is identical. Taking this road makes it harder to achieve an attractive SIR. But hard’s okay, especially when it gives the building owners a more accurate picture of the financial impact of their investment. We assumed that the residual value of equipment was equal to the cost of a standard efficiency replacement in the current year, and that the value depreciated linearly to zero at its industry-accepted useful life. The total investment cost of an EEM was calculated as the installed cost of the high-efficiency replacement less the installed cost of a standard-efficiency replacement, plus the residual value of the existing measure. Other key assumptions and parameters included a ten-year time horizon, a discount rate of 2%, retail pricing for measures (incentives and rebates were ignored), an electricity price of $0.13/kWh, and an annual electricity escalation rate of 3%. To achieve a high SIR, we tried to focus on replacing old, inefficient equipment with high-efficiency equipment that had minimal incremental costs. Win-win scenarios like this weren’t possible with each individual measure, but even so, some underperforming individual measures were retained because they contributed to the overall energy savings goal of 30% without compromising the overall SIR goal of 1 or higher. For Building America protocols, see Hendron, R., and C. Engebrecht. Building America House Simulation Protocols, NREL Report No. TP-550-49426. Golden, CO: National Renewable Energy Laboratory, 2010. For typical 30% improvements cited in some weatherization programs, see Blasnik, M. “Energy Conservation: What are my choices? What can I save?” Download paper presented at the 21st Annual National Low-Income Energy Conference, Nashville, TN, June 5, 2007. 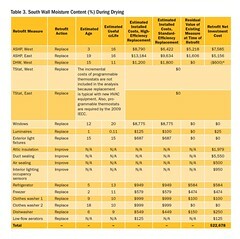 The total investment for the retrofit was $22,678 (see Table 3). Total annual monetized savings over the ten-year time horizon were calculated at $50,875, yielding a SIR of 2.2. Greater savings and higher SIRs would be expected if the calculation were done over the useful life of the equipment. And for those of you who think in terms of simple payback, it was 5.2 years ($22,678 investment to provide annual energy savings of $4,403). air sealing the 13 chimney flues, which would greatly improve the airtightness of the building. The lessons learned from this project can be applied not only to group homes, but also to other similar R-4 occupancies, such as rehabilitation and assisted-living facilities. Often, the organizations that run these facilities are nonprofits or have limited funding. They would greatly benefit from the monetized energy savings and quick paybacks that energy efficiency retrofits such as this one can provide. Mike Moore is a professional engineer and technical consultant and James M. Lyons is a mechanical and environmental engineer at Newport Ventures.